Home Training Guide Acoustic Guitar String Guide: Strings Explained! The kind of strings your guitar uses tremendously affects how it sounds. So much that you could make an inexpensive guitar sound astonishingly good for the money with the right set of strings. However, you can’t just take and slap any string set onto your guitar. For an untrained eye and ear, all guitar strings may be very similar to each other. But that’s not how things go. On our little guide, we are going to examine in-depth what makes guitar strings. In the end, you should be able to pick the right strings for your instrument fairly easily. The very first thing you need to understand is that acoustic and classical/flamenco guitars use completely different kind of strings, even though these instruments are similar in appearance. The construction difference between acoustic and classical/flamenco guitars is the reason why they are fitted with different kinds of strings. 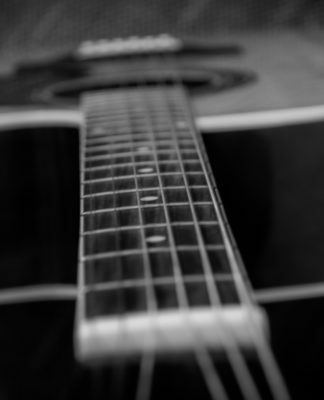 Acoustic guitars generally use steel strings, while classical/flamenco guitars use nylon strings. Classical guitars just aren’t built tough enough to withstand the tension of steel strings. This means, in the end, that acoustic and classical guitar strings are not interchangeable. We have a detailed article on Acoustic Vs Classical Guitar to addressed the age-old dilemma of every beginner, you can check that out too. The string gauge is basically its thickness. Gauges are denoted in thousandths of an inch, e.g. a 13-gauge string has a thickness of .013 inches. String gauges typically range from .010 to .059, and the sound varies widely across the gauges. The thinner lighter gauges are generally easier to play, which is why they are more suitable for beginners who don’t yet have sufficient finger strength. In addition, it is much easier to bend notes and do fretting on them since they aren’t as rigid as heavier strings. Lastly, light gauges exert less tension on the guitar’s neck, which makes them safer to use with weaker necks and possibly with vintage guitars. On the other hand, lighter-gauge strings break easier and are more prone to buzzing, especially in guitars with low action. And they overall produce less volume and shorter sustain than heavier strings. Heavy-gauge strings pretty much mirror the features of light strings. Heavy strings are more rigid than light strings, which generally makes them harder to play. Usually, heavy-gauge strings aren’t used by newbies. Instead, they are chosen by more experienced musicians who need more volume and sustain and who have the strength to play on such strings. On the other hand, heavy strings exert more tension on the guitar neck. This means that you would need to make sure that your guitar’s neck is strong enough to support heavy strings before buying them. Larger and more durable acoustic guitars. Bronze, which imparts a bright and ringing tone to the strings. These strings age relatively quickly due to bronze’s tendency to oxidize. Phosphor bronze, which is a bit warmer than bronze yet still quite crisp. The phosphor alloy is added to extend the strings’ life. Aluminum bronze. These strings have a pronounced bass and highs crisper than in phosphor bronze strings. Silk and steel. These strings have a steel core and a silk, copper, or nylon wrap on the lower strings. Steel strings produce a more delicate tone and are soft to the touch, which makes them popular among fingerstyle players. Polymer-coated. Polymer-coated strings have less brightness and sustain in them than comparable uncoated strings. The benefit of the polymer coating is the added corrosion resistance. So the reduced brightness basically is the trade-off of the corrosion resistance. Brass strings have a metallic and bright character. Flat wire is used to create a string with a smooth surface. Flatwound strings deliver warmer sound, shorter sustain, have a longer life, higher tension, less grip for bending, and generally cause less fret wear. These strings are generally better for jazz. Round wire is used to create a string with a textured surface. Roundwound strings typically have a shorter life, lower tension, brighter sound, longer sustain, more grip for bending and cause in more fret wear. These strings are more suitable for music like rock n roll. This is a mix of the previous two techniques, with the round wire flattened only partially. Among these techniques, the most popular and the cheapest is the roundwound. Halfrounds are the least popular, and most of the people should just disregard them when looking for strings. There is a solid core wire beneath the outer winding of the bass strings. This wire can be of two types: round-core or hex-core. The first guitar string cores have been all made round. But one day, D’Addario introduced hex strings to the market. In a short time, hex cores became the industry standard for the majority of manufacturers. The reason for the popularity of hex cores is that their sharp edges grip the outer wire very well, which prevents slippage. The hex shape also allowed to make machine winding more accurate and consistent. Partly due to their inconsistency, round-core strings are very commonly assembled by hand nowadays. Deliver a consistent, modern, and brighter tone with less sustain. Deliver an inconsistent, vintage, and warmer tone with more sustain. 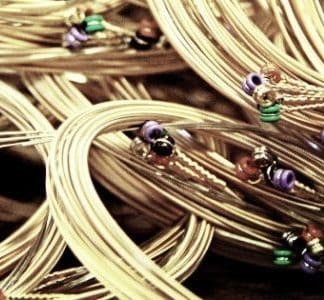 This is pretty much everything you need to know about acoustic guitar strings to get started. We’ve gone pretty deep in our guide, but it doesn’t mean that you should start looking for the right wind as a beginner, for example. Only go as deep as your playing style requires. 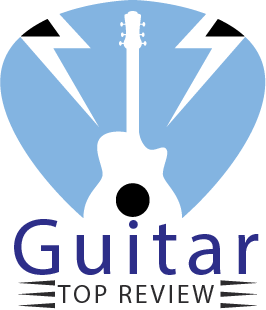 Next articleFender CD-60CE Review 2019!